James Chen, Kansas State University assistant professor and Keystone research faculty scholar in mechanical and nuclear engineering, has been elected as an honorary fellow for the Australian Institute of High Energetic Materials. The institute was established and is operated by scientists seeking cutting-edge innovation for advanced research activities, through international collaboration between universities and scientific groups. 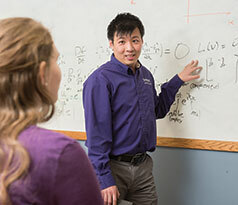 Chen is director of the Multiscale Computational Physics Lab at K-State, which focuses on physical phenomena across multiple spatial and temporal scales, such as turbulence and micro-/nano-mechanics.